One quiet day when no one was home I found an old box in our basement. I had just read a story in The Good and Beautiful God of a professor who had his students beat up a box to prove a theological point. I’ll get to the point in second, but let me back up to tell you what happened the day I gave it a go. At first I was careful. I gently took a knife and punctured a hole through it. To my surprise tears flooded my eyes. I kept going being less and less gentle with this box. Each rip, each stomp represented something in my life that had changed who I was, something that hurt deeply. Each crumple and each hole was a painful memory from my past. I kicked the box around my kitchen awhile longer thankful that no one was around to watch the spectacle. I took my beat-up chunk of cardboard and went to my dark basement. 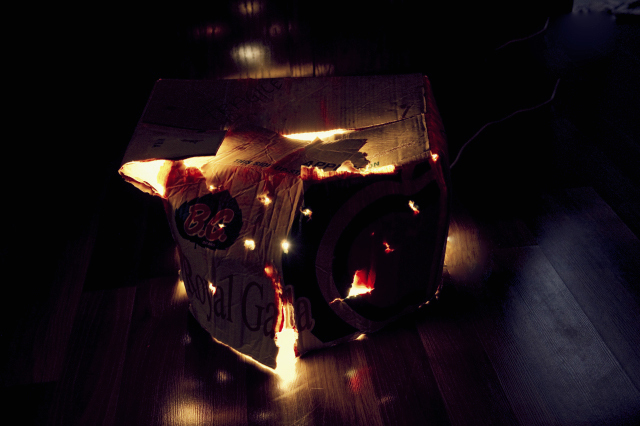 I stuck a light inside the box and stood back to survey the damage. Shining into the darkness was the light that was inside the beaten up box. It occurred to me in that moment that where the most damage had been inflicted was the exact spot that the light could escape more easily and shine the furthest. How often do we try to the cover the wounds and hurts from our own life? But here’s the thing...when you attempt to cover the rips, the wounds, and the imperfections life has left you on, you deny God the ability to shine through your weakness. Living as authentic Christians we don't get to claim we are perfect either in our words, our actions, or by what we keep concealed deep inside. You see, on our own, our lives are a dumpy piece of unusable cardboard. But, the moment we invite God to be part of our lives, he enters in and does what he does best. He takes our damaged lives and enters into a union with us so he can shine through our mess into the darkness around us. That's the Good News of our salvation! There is nothing we can do in our own ability to cause God's hope to shine forth from us. We are not saved by our good deeds. We can only walk out our lives openly and vulnerably in a way that others can see that it is by what Christ has done for us that we find our value. We need to stop beating ourselves up to be better tomorrow, continually grasping at being a “perfect” Christian and falling short every time, until defeat swallows you up. It’s time to let perfection go, my friend. Neither you, nor I will make that mark on this side of heaven. Remember God’s promise to Paul though? He says that his power is made perfect in our weakness. (2 Cor. 12:9) He understands we are weak, and imperfect. He weeps for us when we are crushed and damaged by the sin of this world. Then, His strength and power shine brightly out of our wounds and darkness loses the battle once again. I encourage you this week to let your guard down and allow God to shine through your weakness spreading hope to those around you.